As always reliable and on the correct day.Amazing flowers and my children were both very pleased with the choice of wine. Exactly what I ordered and looked like the picture. ???? The whole process went smoothly. Easy way to choose what you are looking for. 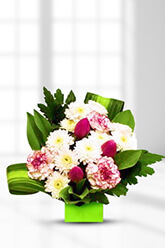 Our floral arrangement was professionally put together and was delivered in good time. Well done to all involved. Easy to order. Good service.